This charming Humming-bird was discovered by the great navigator, Captain Cook, who found it abundant at Nootka Sound. It does not appear to have been seen by Dr. RICHARDSON or Mr. DRUMMOND in the northern parts of America, traversed by those most zealous and highly talented naturalists. As no account has hitherto been given of its habits, the following notices from my friends Mr. NUTTALL and Mr. TOWNSEND, will, I doubt not, prove highly interesting. "We began," says the first of these enterprising travellers, "to meet with this species near the Blue Mountains of the Columbia river, in the autumn, as we proceeded to the west. These were all young birds, and were not very easily distinguished from those of the common species of the same age. We now for the first time (April 16) saw the males in numbers, darting, burring, and squeaking in the usual manner of their tribe; but when engaged in collecting its accustomed sweets in all the energy of life, it seemed like a breathing gem, or magic carbuncle of glowing fire, stretching out its gorgeous ruff, as if to emulate the sun itself in splendour. Towards the close of May, the females were sitting, at which time the males were uncommonly quarrelsome and vigilant, darting out at me as I approached the tree probably near the nest, looking like an angry coal of brilliant fire, passing within very little distance of my face, returning several times to the attack, sinking and darting with the utmost velocity, at the same time uttering a curious reverberating sharp bleat, somewhat similar to the quivering twang of a dead twig, yet also so much like the real bleat of some small quadruped, that for some time I searched the ground instead of the air, for the actor in the scene. At other times, the males were seen darting up high in the air, and whirling about each other in great anger, and with much velocity. After these manoeuvres the aggressor returned to the same dead twig, where for days he regularly took his station with all the courage and angry vigilance of a King-bird. The angry hissing or bleating note of this species seems something like wht 't 't 't 't sh vee, tremulously uttered as it whirls and sweeps through the air, like a musket-ball, accompanied also by something like the whirr of the Night-hawk. On the 29th of May, I found a nest of this species in a forked branch of the Nootka Bramble, Rubus Nutkanus. The female was sitting on two eggs, of the same shape and colour as those of the common species. The nest also was perfectly similar, but somewhat deeper. As I approached, the female came hovering round the nest, and soon after, when all was still, she resumed her place contentedly." Mr. TOWNSEND's note is as follows:--"Nootka Sound Humming-bird, Trochilus rufus, Ah-puets-Rinne of the Chinooks. On a clear day the male may be seen to rise to a great height in the air, and descend instantly near the earth, then mount again to the same altitude as at first, performing in the evolution the half of a large circle. During the descent it emits a strange and astonishingly loud note, which can be compared to nothing but the rubbing together of the limbs of trees during a high wind. I heard this singular note repeatedly last spring and summer, but did not then discover to what it belonged. I did not suppose it to be a bird at all, and least of all a Humming-bird. The observer thinks it almost impossible that so small a creature can be capable of producing so much sound. I have never observed this habit upon a dull or cloudy day." Mr. NUTTALL having presented me with the nest of this species attached to the twig to which the bird had fastened it, my amiable friend Miss MARTIN has figured it for me, as well as the plant, about which these lovely creatures are represented. The nest, which measures two inches and a quarter in height, and an inch and three quarters in breadth, at the upper part, is composed externally of mosses, lichens, and a few feathers, with slender fibrous roots interwoven, and lined with fine cottony seed-down. TROCHILUS RUFUS, Gmel. Syst. Nat., vol. i. p. 497. TROCHILUS (SELASPHORUS) RUFUS, Cinnamon or Nootka Humming-bird, Swains. and Rich. F. Bor. Amer., vol. ii. p. 324. RUFFED-NECKED HUMMING-BIRD, Trochilus rufus, Aud. Orn. Biog., vol. iv.p. 555. Male, 3 7/12, wing, 1 (7 1/4)/12. From California along the north-west coast to Nootka Sound. Abundant. Migratory. Bill long, straight, subulate, somewhat depressed at the base, acute; upper mandible with the dorsal line straight, the ridge narrow at the base, broad and convex toward the end, the sides convex, the edges overlapping, the tip acuminate; lower mandible with the angle very long and extremely narrow, the dorsal line straight, the edges erect, the tip acuminate. Nostrils basal, linear. Head of ordinary size, oblong; neck short; body slender. Feet very small; tarsus very short, feathered more than half-way down, toes small; the lateral equal, the middle toe not much longer, the hind toe a little shorter than the lateral, anterior toes united at the base; claws rather long, arched, compressed, laterally grooved, very acute. Plumage soft and blended; feathers on the throat, fore part and sides of the neck oblong-obovate, with the filaments towards the end thickened and flattened, with metallic gloss, those on the sides of the neck elongated and erectile. Wings rather short, extremely narrow, falcate, pointed; the primaries rapidly graduated, the second being longest, but only slightly longer than the first; these two quills taper to a point; the rest are broader, and gradually become less pointed; the secondaries are extremely short, and only five in number. Tail rather long, broad, graduated, the lateral feathers four and a half twelfths of an inch shorter than the central; the latter are extremely broad, measuring four and a half twelfths across, and the rest gradually diminish to the lateral, which are very narrow; all obtusely pointed. Bill brownish-black; toes brown, claws dusky. The general colour of the upper parts is bright cinnamon or reddish-orange; the head bronzed green, the wings dusky, the coverts glossed with green, the primaries with purplish; each of the tail-feathers has a narrow longitudinal lanceolate median streak toward the end. The loral space, a narrow band over the eye, another beneath it, and the auriculars are reddish-orange; the scale-like feathers of the throat and sides of the neck are splendent fire-red, purplish-red, yellowish-red, greenish-yellow or yellowish-green, according to the light in which they are viewed; behind them, on the lower part of the neck, is a broad band of reddish-white; the rest of the lower parts are like the upper, the abdomen inclining to white. Length to end of tail 3 7/12 inches; bill along the ridge (7 3/4)/12, along the edge of lower mandible (9 1/4)/12; wing from flexure 1 (7 1/4)/12; tail 1 (3 1/2)/12; tarsus (1 1/2)/12; hind toe (1 1/2)/12, its claw (1 1/4)/12, middle toe (2 1/4)/12, its claw (1 1/2)/12. The female has the bill and feet coloured as in the male. The upper parts are gold-green, the head inclining to brown; the wings as in the male; the tail feathers reddish-orange at the base, brownish-black toward the end, the tip white. The lower parts are white, tinged with rufous, of which colour, especially, are the sides; the throat marked with roundish spots of metallic greenish-red. Length to end of tail 3 (7 1/2)/12 inches; bill along the ridge (8 3/4)/12; wing from flexure 1 10/12; tail 1 (1 1/2)/12. The above descriptions are from two individuals shot by Mr. TOWNSEND on the "Columbia river, 30th May, 1835." A "young male, Columbia river, 29th May, 1835," resembles the female as above described, differing only in having the metallic spots on the throat larger. A "young female, Columbia river, June 10th, 1835," differs from the adult only in wanting the metallic spots on the throat, which is spotted with greenish-brown. 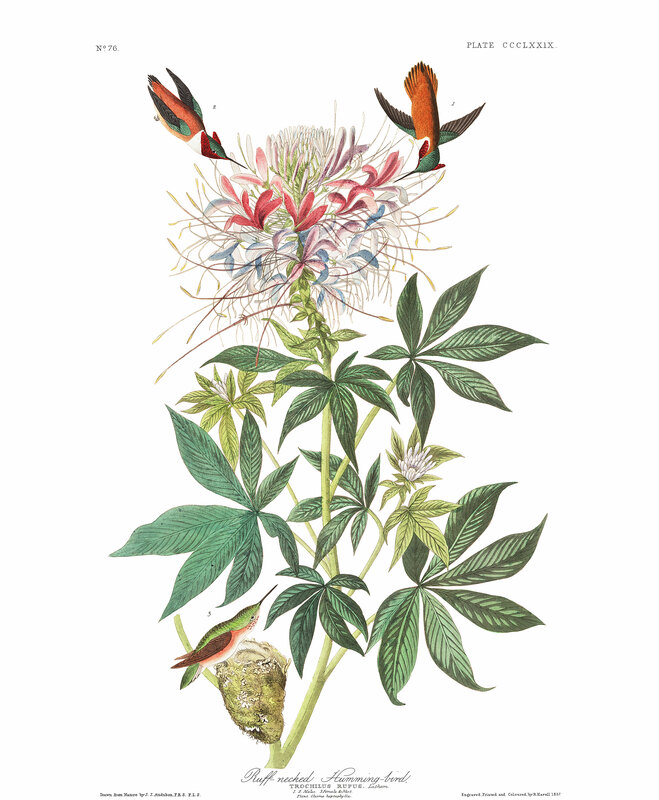 The beautiful plant represented in the plate belongs to Tetradynamia Siliquosa of the Linnaean arrangement, and to the genus Cleome, characterized by having three nectariferous glandules at each corner of the calyx, the lower excepted; all the petals ascending; the germen stipitate; the siliqua unilocular, two-valved. The species, C. heptaphylla, is distinguished by its septenate leaves, of which the leaflets are lanceolate, acuminate, and of a deep green colour. It grows in South Carolina and Georgia.